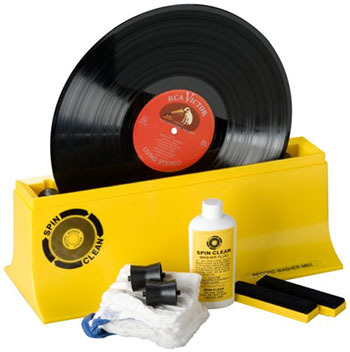 Looking at the Spin-Clean Record Washer, you’d think that it rotates your record through a cleaning bath on some kind of motor, but no, you have to turn it by hand. The yellow box is a plastic tub with two plastic rollers. The “washer fluid” is water, alcohol, and a tiny bit of detergent. The price for this combination of plastic tub, velvet “brushes”, and bottle of relabeled Windex is $79.00. If you must buy dirty records, a microfiber cloth ($13 for a pack of 24) and a bottle of Windex will work just as well for cleaning them.